Three Good Rats: Whose Body? When a body is found in a bathtub, Lord Peter Wimsey must not only determine the identity of the killer, but also that of the victim. He was wearing nothing but a pince-nez, and appeared around the same time as the London financier Sir Reuben Levy disappeared. Is this two mysteries, or one? Enlisting the help of his friend Inspector Parker, his resourceful manservant, Bunter, and even his mother, the Dowager Duchess of Denver, Wimsey is determined to get to the bottom of the mystery. Reading a book written so long ago is a rather different experience than reading a historical novel, that is, a novel written now about a former time period. The author of a historical novel would feel a need to provide context and explain the unfamiliar. But here, we're just plopped in the middle of a very different period and left to figure it out ourselves. It's not difficult - this isn't a big novel filled with complicated political and military references (see: War and Peace) but rather a short and simple story of a particular mystery. But still, I noticed things: the use of the apostrophe in 'bus, for instance, which reminded me that it used to be a longer word. Or the uncomfortable discussions of the missing Mr. Levy, who is repeatedly referred to as "the Jew" and described as "Hebrew." I kept cringing and expecting anti-Semitic commentary which, thankfully, never came. But obviously, cultural sensitivity changes through time so it can be a bit jarring - and educational - to read older books. Wimsey was an enjoyable character in many ways. I like his habit of ending a sentence with "what?" as in, "Hate anything tiresome happenin' before breakfast. Takes a man at such a confounded disadvantage, what?" He also took great delight in everything about the case. "I love trifling circumstances...so many man have been hung by trifling circumstances." Although it was a decent story on its own, it was really Wimsey's character that makes it stand out. 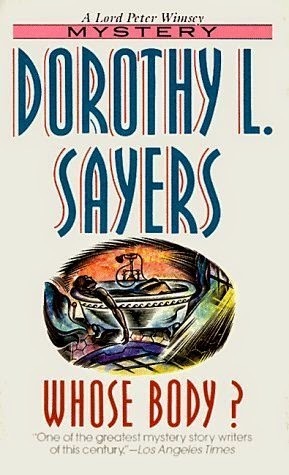 I've heard of Dorothy Sayers and knew she was a well-known and loved mystery author, but never picked up one of her books until now, when we chose Whose Body? for book group. It was a fun little whodoneit, which I found all very charming and British. It was short and easy, a great counterpoint to the mammoth and complex other book I'm reading right now. If you're looking for a easy but entertaining mystery, I bet this would fit the bill.